Save $9 off per session - that's a total of almost $50 saved!!! when you register for the whole series. Love the cool and random look of urban backgrounds? This class requires no painting skill yet produces amazing results using a variety of tools. See how fun it is to use everyday items such as cardboard, cups, hair rollers, hardware items and more to create your own individual layered paintings. We’ll work on a special dry-wax paper surface that is flexible and absorbent (yet sturdy) – perfect for building up lots of luscious layers! Use your favorite hand painted papers to make a one-of-a-kind composition book. Plus leave with a stack of papers that can become the base of your next painting, collage, notecard or journal. You’ll find that you can glue these edgy backgrounds to just about anything! Take mark-making to a personal level. 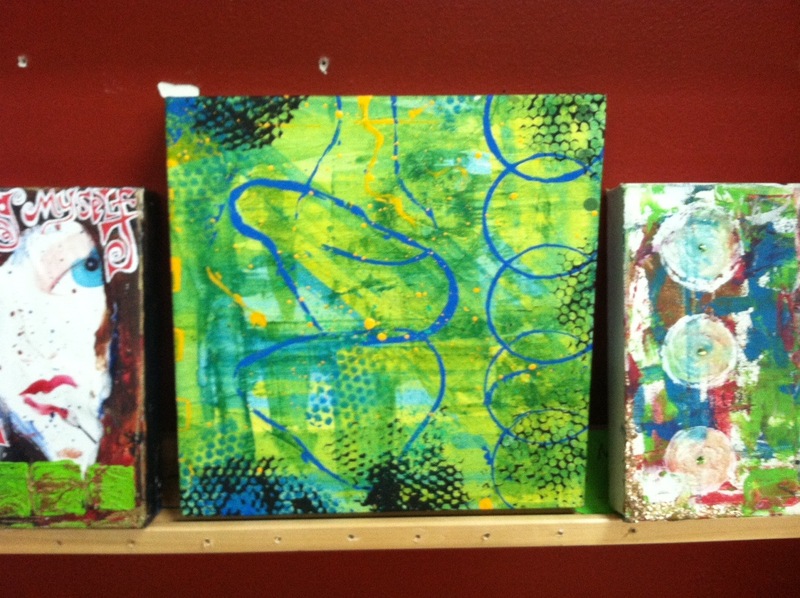 Experiment with creating your own symbols to make your own style of marks on your paintings and mixed-media projects. You’ll see how easy it is to design and carve your own unique stamp using carving tools and soft rubber. You’ll make even more papers (add even more marks to ones you already have) – in a more symbolic and intentional way. Play with stencils, monoprints and Gelli Plate prints – the ARTbar way! We’ll explore making our own custom stencils, as well as techniques in additive and subtractive prints. Frame your favorite prints or turn them into a set of notecards. Leave with some fun new stencils to use with your own projects. Sorry, there are no refunds or rescheduling of missed classes when you purchase with the series.